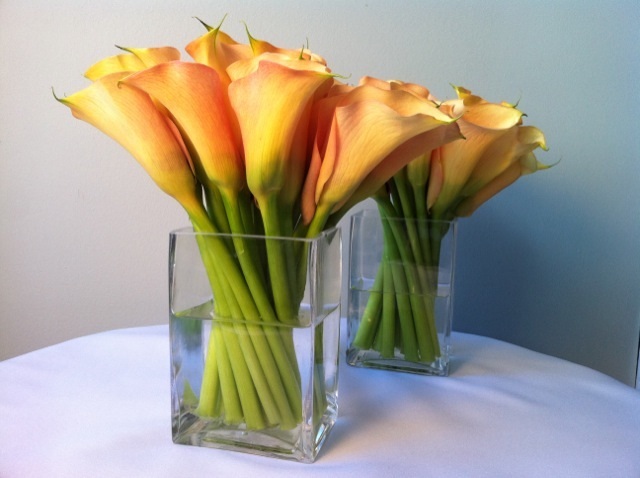 Calla Lillies: Not Just For Easter! Their stalks, which can grow up to 36 inches long, are actually somewhat sculptable. Floral designers have gotten creative with the flexibility, creating some incredibly sculptural arrangements. Today we took a simple, sophisticated approach, creating a beautiful arrangement with an angular base that pleases the eye from stem to bloom. I’m always kind of fascinated by the backstory of flowers… from where they grew and how they get to the store. So often we’re used to seeing the final product… so rarely do we get the stages in between! 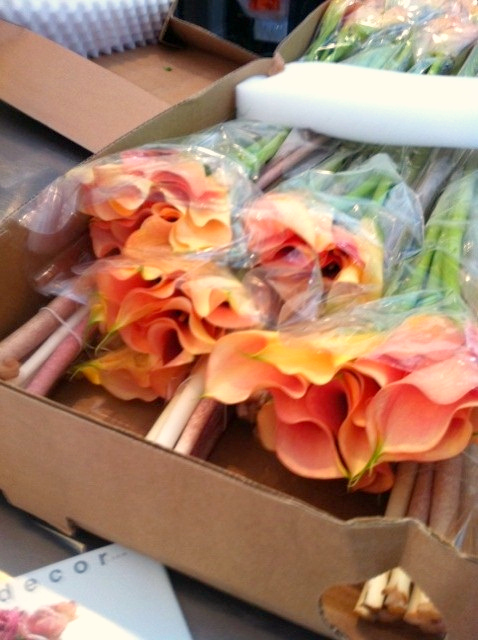 The lilies came in a long box, and were about 28 inches long, wrapped in plastic, and stacked. That was it! We each had about a dozen to work with. 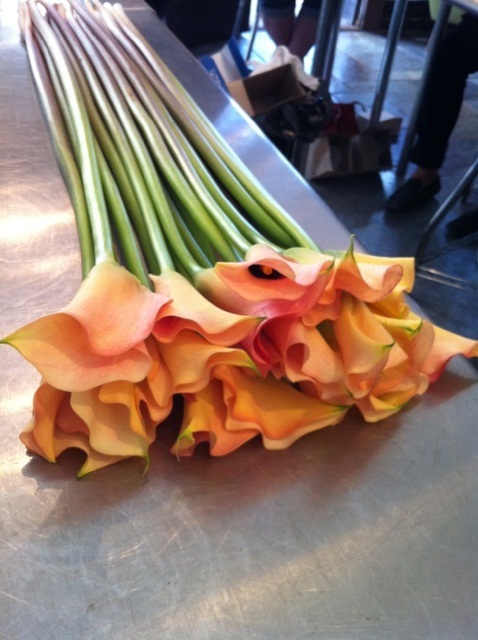 Given their flexibility, we took each one and carefully worked with the stems so that each was as straight as possible. After they were straightened, (see left) we took six stems, and laid them on the table, tightly next to one another. The center stem was laid with the “face” of the lily against the table, (think of the long slender tip of the bloom as the chin. The stems on each side were laid so they ‘face’ was turned away from the center. 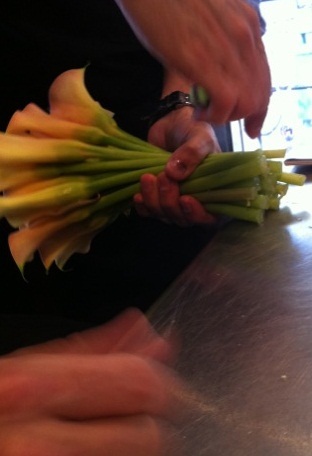 The result was a tight stack of lilies, with the blooms all facing out. (I’d love to show you a photo but my hands were full! We grabbed a clear elastic band to keep the together, and made things easier by chopping a good portion of the long stalks off. 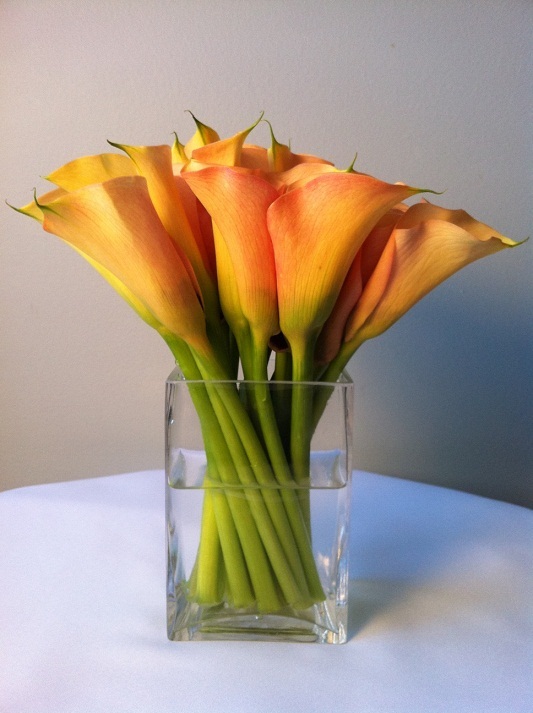 Once they were cut to a reasonable length, we twisted the bouquet until the stems began to take on an angle when set into the vase. (The vase was about seven inches high) The clear band remained around the bouquet, but was positioned so that the water line obscures it. We kept checking the angles, and ensuring that the tops of the blooms were level. This took some careful trimming on the bottom of the stems, cutting them flat on the bottom while the stems were still at an angle. After some adjusting, then some more adjusting (this is actually harder than it looks!) We finished the bouquet. Simple, classic, it’s really all about the flowers. Both alone, and in pairs! VIDEO: Why This “How To Cook Bacon Perfectly” Video Is Going Viral. BEFORE and AFTER: Abandoned Chair Gets New Look, New Home.